I have a confession to make: until just a couple of years ago, I never made pie crust from scratch. The ability to roll out a pie crust seemed to me to be one of Hercules’ tasks, doable by only the most accomplished of culinary wizards. Or Ma, in Little House on the Prairie. So, on the rare occasions I made pie, I fell back on Pillsbury and their frozen, pre-rolled semblance of a pie crust. Interestingly, until just a couple of years ago, I also never really cared for the crust part of a pie; I thought pie was really only about the filling. It turns out I was missing two critical aspects of pie crust: number 1, butter; number 2 wax paper. I’ll begin with butter. An all butter crust, in my opinion, is the key to pie crust. In fact, pie crust just may be best viewed as a vehicle for eating butter. Some say that it turns out less flaky, but this can be overcome, and the flavor is unbeatable! Plus, compared to Crisco, margarine, vegetable oil, or the manufactured fats in commercial pre-made crusts, butter is a veritable health food. Once the choice of fat has been made, the list of ingredients needed for a pie crust is quite short. You probably have them on hand already: cold butter, flour, salt, baking powder (optional), cold water, and apple cider vinegar (optional). The ingredients come together just as simply as the list. Especially if you have a food processor! Most of the time I avoid fancy equipment when I cook. If a recipe can’t be made with the cookware you could have found in a house on the frontier during the westward expansion, well then generally I want nothing to do with it. BUT, a friend of mine let me use his food processor for the last pie crust I made, and I must admit, I’m starting to sing a different tune. The dough was ready to go practically before I’d even begun. You just put the dry ingredients into the food processor, cut the butter into chunks and add it, whirl for a few moments until it looks like crumbs, pour in the liquid, and whirl a couple more seconds. Then scoop out the crumbles – it won’t be all stuck together yet – and press them together into a ball. Making the dough by hand takes slightly more effort and attention but is more fun in some ways because it really gets you in touch with your ingredients. You begin by mixing the dry ingredients together and adding the cut up cold chunks of butter. Then, use your fingers to rub the flour mix and butter together. You can grab whole chunks and kind of glom them together in a fistful and then break it apart with your fingers. Do this until the butter is fairly well incorporated, so it looks kind of like large crumbs or sand with some chunks of butter still as large as peas. Then add the wet ingredients. Start by mixing with a spoon, but then dig back in with your hands to press the dough together in a ball. Once you have your dough ball from either the food processor or hand method, press it by hand into a flattened, thick disc, wrap it in plastic wrap and chill it in the fridge for at least 20 minutes and preferably an hour. Having well chilled dough is critical because it will help keep the dough cool while you roll it, and this seals butter pockets into the dough, and those butter pockets will eventually become the flaky air pockets that makes for a good pie crust. For a two crust pie (that is, crust on top and bottom), divide the dough into two separate discs, one slightly larger than the other for the bottom, before chilling. Mix and roll using the process I described above. The most recent pie I made was a huckleberry pie with frozen huckleberries that I brought back after picking them in North Idaho. If you ever get the chance to pick huckleberries and bring the extra home, do it! It’s totally worth the sticky mess that may or may not wind up in your suitcase pocket. 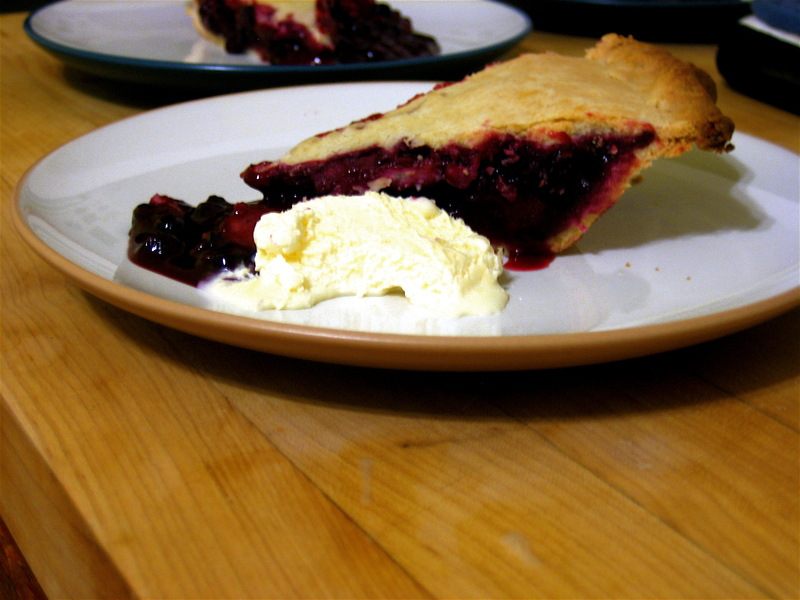 Huckleberries are a uniquely delicious berry for pies, with a perfect balance of sweet and tart flavor, and they seem to be a regional obsession in North Idaho. For any fruit or berry pie you need about 5-6 cups of fruit, cleaned and sliced if needed. The amount of sugar will really vary depending on whether you’re using sweeter or tarter fruit but it’s usually in the realm of 1 cup (berries tend to be more tart, stone fruits are in the middle, while many apples and pears are sweeter and need almost no sugar). You’ll also need a couple of Tbs. (2-5) of flour for thickening. Here’s what I did for the huckleberry pie: 4 cups huckleberries (any other type of berry would do as well), 2 peaches sliced up (because I had them around and the sweet, mellow peach pairs well with pretty much any berry), ½ cup white sugar, 1/3 cup brown sugar (using some brown sugar gives a little deeper flavor), ¼ cup flour, 1 Tablespoon vanilla. Mix all these ingredients together in a big bowl, then pour it into the bottom pie crust. Cover with the top crust and pinch the top and bottom together. You can shape the edge in waves with your fingers, or press little ridges into it with a fork. Make a few gashes in the top of the pie to allow steam to escape. Bake at 425˚F for 15 minutes, then reduce the heat to 375˚F and bake for another 50-60 minutes, until you can see through the gashes that it’s bubbling inside and the crust is golden brown. Remove the pie from the oven and let it cool before serving (this is the hard part because I hate waiting, but if you don’t let it cool it will be a runny mess. Of course, if you don’t mind a runny mess, because it also happens to be a delicious mess, then go ahead and serve it warm. Personally, I enjoy the way vanilla ice cream melts all over warm pie). If your pie turns out anything like mine, at least one of your dinner partners will jump up and kiss you with gratitude! There is a cloth and rolling pin cover that works great for rolling out pie crusts if you don’t want to waste wax paper. Once you use it, you just toss it in a bag and throw it in the freezer. They don’t get washed. I don’t have one yet, unfortunately, but my mother uses it and has no problem with the dough sticking. My grandma taught me to make pie crust with lard, which was what they had on the farm. Would you go that far? It’s delicious . . . I would definitely go that far!! If I had easy access to lard I would love to make pie crust with it. I think lard is undervalued – it’s a very stable fat for cooking, and if the pigs were raised on pasture (rather than in a giant industrial farm) as I’m sure your grandma’s was, then it’s actually pretty healthy. You are currently reading No more humble pie – or, how to make (all-butter) pie crust at Five And Spice.